When you’re watching a movie, there’s a whole story in front of you that offers life lessons in one way or another. Be it the hero who saves the situation, the stray son that eventually acknowledges his ancestors’ wisdom or common situations we can all connect with, there’s a lot of learning behind the scenarios. And watching a movie with your grandchild is a way to learn those things together. To share a common language and similar values. Because, in the end, they are a part of you. Because laughter is contagious, we tend to laugh more when we’re with other people. This principle is most evident when you watch movies with somebody else, as opposed to watching them on your own. When we laugh, there’s an oxytocin and endorphin release in our bodies, and that makes us feel good. Therefore, we tend to associate that feeling with the ones we had the laughter. This is reason enough to step up the game and ensure that the grandparent – grandchildren relationship is the best one you can have. 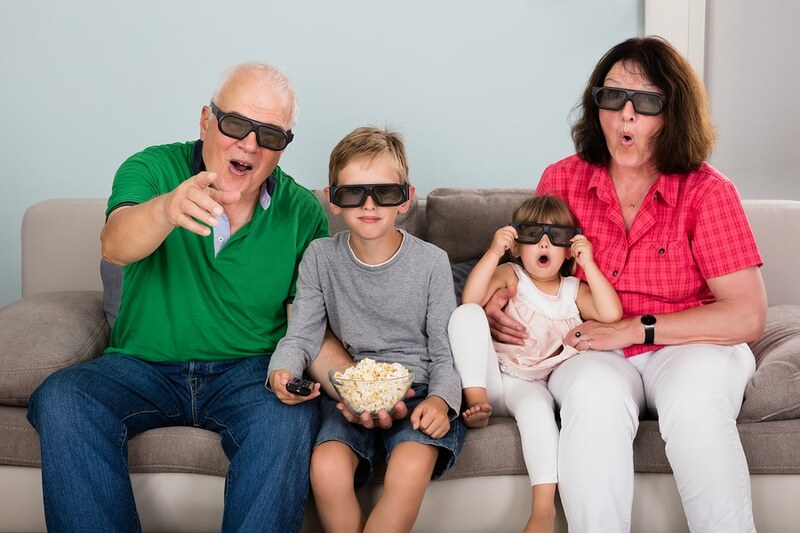 You can invite your grandchild to visit and stay overnight for a movie marathon. You can pick two or three movies that all of you will enjoy and that are also educational. Even if it’s called a “movie marathon,” you don’t have to stay up late. Start it by the afternoon, and you will have it finished by bedtime. However, because your grandchild is staying over, they might have trouble falling asleep because they’re used to sleeping in their beds at home. If that is likely to happen, plan some extra time for storytelling or to tuck them in. Drive-in theaters were the thing at the beginning of the last century. As color television and VCR’s made their way in every home, the interest towards them declined, and most of them were closed. Today, there are only a few left, but the good news is that the younger generations are eager to learn more about them and live the experience of a drive-in theater. If you’re lucky enough to have one around you, take them there. They will love it. If you’re a fan of large screens and surround sound, you can take your grandkid to the cinema. Even though you can watch the same movie at home, there’s another experience you have when you’re in a big room full of people who are just as anxious as you are to find out when the leading actor will get back in his hometown and reunite with his high school sweetheart. To become ad-hoc movie critics is probably the most fun thing you can do together. Pick some of the greatest movies in the cinematic history that had also had a remake, watch them both, and comment on the differences. Not only you’ll have the best laughter of your life, but they’ll also learn to have different perspectives on the same subject. Both of you will see how the others tend to interpret things, and you’ll get to understand each other better. Another way to keep in touch with them (provided you have the time for that) is to watch the same TV series. You can update one another about new episodes or sudden scenario changes that no one would expect. No, this doesn’t mean to give spoilers, but to leave cliffhangers intended to determine the other to see the following episode as soon as it’s released. If you don’t taste the series released recently, you can always choose an older show you believe they will find interesting. The suggestions presented here are just a few ways to create a unique bond with your grandchild. More than anything else, what really matters is to spend quality time together and create lasting memories. There are many things you can teach and show them, but just a few things can replace the shared laughter over a movie night. And, who knows – if the cinema bugs bite them, maybe you will check all these suggestions off the list.